You are invited to be part of this event to sell your merchandise at our craft fair this November. The success of this craft fair depends on you. This fair will be advertised at the Post as well as on several websites, social media sites and in the local paper but please help spread the word. What better way to get your Christmas shopping done then by supporting your fellow Post members and local small businesses. 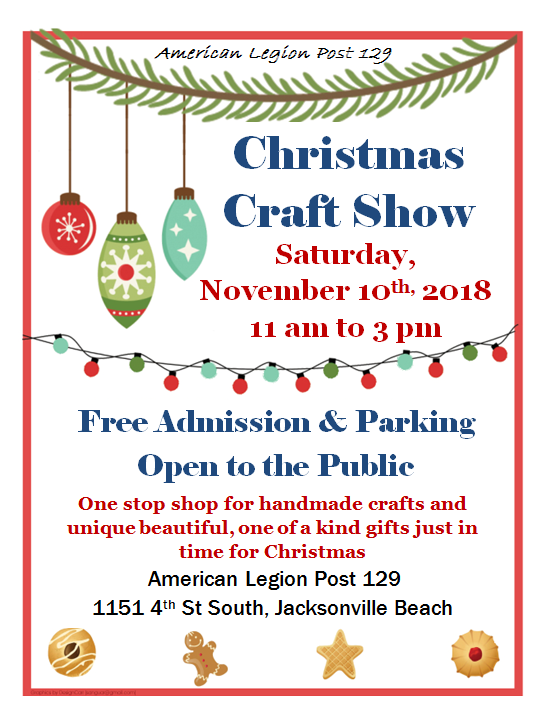 Craft Show Location: American Legion Post 129, 1151 4th St South, Jacksonville Beach, FL in the newly remodeled south hall. Cost: $20 for a 8’ x 30” table - Includes two chairs. If electric is needed for displays please indicate on application. Also you are responsible for bringing your own extension cord and adapters. Vendor Types: Vendors selling arts and crafts, food products, consultants and retail are all welcome to participate.